Assigned to supervise a burgeoning civilian refugee camp housed on the Galactica's starboard hangar deck, Capt. Karl Agathon faces a restive population, including many Sagittarons. Considered insular and backward by their fellow Colonial citizens, the Sagittarons are used to discrimination — and to fighting back. Worse, the civilian doctor overseeing the refugees, Dr. Mike Roberts, diagnoses a number of the Sagittarons with Mellorak sickness . The disease is curable if it's treated within 48 hours. Untreated, it's fatal — and the Sagittarons don't believe in medical care. To Agathon's frustration, the sickness spreads and refugees start dying, all because the Sagittarons refuse treatment. Then a distraught Sagittaron mother, Mrs. King, tells Agathon that her grown son died even after she allowed Dr. Roberts to treat him. Mrs. King believes that Roberts murdered her son. As Agathon ponders the woman's claim, he grows increasingly sympathetic to the Sagittarons' plight — and thus increasingly alienated from his own comrades. Soon, another sick Sagittaron dies after being treated — against his will — by Roberts. A riot erupts in the hangar bay as angry, frightened refugees insist that Roberts is murdering them out of ethnic hatred. After breaking up the fight, Agathon takes the Sagittarons' case directly to Colonel Tigh and Admiral Adama. He denounces Roberts as a disruptive man and, possibly, a killer. Adama rejects those allegations. Tigh, who came to trust Roberts in the resistance movement on New Caprica, then pursues Agathon into the corridor and accuses him of always taking the wrong side in any fight. Agathon, disgusted, strikes his superior officer. Soon afterward, his daughter Hera falls ill, and Roberts cures her successfully. At this, even Agathon's wife Sharon suspects that her husband is overreacting to the Sagittarons' paranoia. Agathon, however, can't put Mrs. King out of his mind. He secretly inspects Roberts's medical files and discovers evidence that, on New Caprica, the doctor discriminated against certain groups: higher percentages of Picons and Sagittarons died under his care than did Capricans. Doc Cottle catches Agathon with the files and dismisses his concerns, even after Agathon begs him to perform an autopsy to see how Mrs. King's son really died. - Roslin meeting with Vice President Tom Zarek. - The mother of the boy who died confronting Helo. - Athena meeting with Caprica Six. - The return of the Baltar in Caprica Six' head. - Roslin covertly monitoring Athena's conversation with Six and Six' conversation with the Baltar in her head. 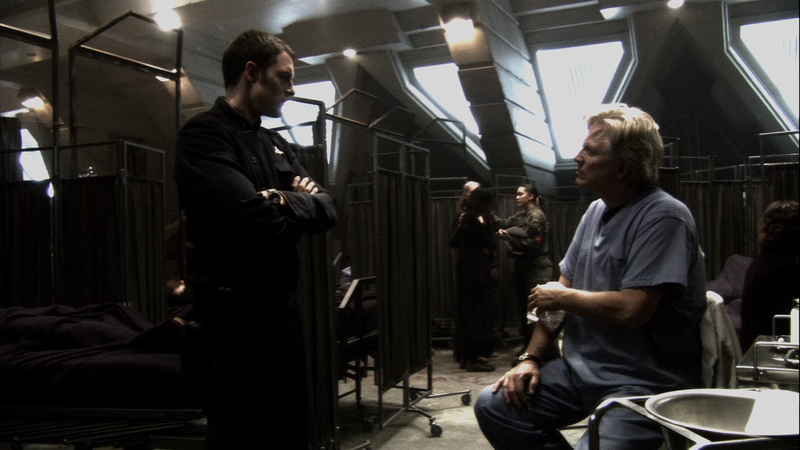 - Adama: "Captain, I have the former president of the colonies sitting in a prison cell, a Cylon woman is in custody, and a population that would love nothing more than to tear both of them apart. My ship is over crowded and I have an epidemic on my hands." - Tigh's confrontation with Helo about Dr. Robert. - Cottle confronting Helo about Helo sneaking into his office. - Tigh and Cottle realizing Dr. Robert was killing Sagittarons. - Dr. Robert: "Remember what you used to say, Saul? Aside from a Cylon is there anything that you hate more than a Sagittaron?" Tigh: "I'll tell ya what I hate, Mike. Being wrong." The Woman King is an unusual episode for Battlestar Galactica twofold. Firstly, it's most unusual in that it centers mostly around Helo and his sort of penal job of dealing with civilians living aboard Galactica, but also unusual in that the central moral issue of the episode's plot centers around a very overdone concept: racism. Indeed, the episode gets off to a very weak start. The first scene that caught my attention was the marvelous stuff between Roslin and Zarek. But as Helo's story develops, it gets exponentially more interesting. I think the biggest reason The Woman King is a very enjoyable episode is due to its well executed, albeit conventional nature. The Woman King is essentially the same story idea as Black Market. Both episodes dealt with a niche in civilian life in the fleet and both episodes centered around a major character doing a crime investigation. The difference is where Black Market slapped together two incompatible plots, The Woman King skillfully centered around a single plot. The devil is in the details in this episode. It's fascinating to see what Helo's and Sharon's private life is like on board the Galactica in detail. It is as well rewarding to finally see Hera now a part of it. Overarching details that were included were enhancements to the episode, but not diminishing to the central plot. Again, Zarek's scene was great and Sharon's visit with Six was equally great. And I love the return of the Baltar in Six' head, for all that I still loathe the technical paradox behind its original introduction. Tigh's performance was above average in this episode. If there's one thing his character excels at it, it's bitterness and hatred. His creepy confrontation with Helo over the sullying of Dr. Robert's good name was fantastic. Everything from the little groan Tigh made after being hit to the sadistic laugh he let out as he walked off was spot on acting and damn amusing. And ultimately, again, while the plot was conventional, I was pleased to see how well executed it was. Part of me was wishing they would have taken this opportunity to kill Dee's character off as I liked how Dr. Robert justified his racism as a means to conserve resources, thereby making him a more complex character than such characters are usually portrayed. During his expository speech at the end of the episode, I'm right there with him agreeing with him, right up until I realize "oh crap, he almost killed Dee!" That's some good public speaking skills right there. Finally, "The Woman King" herself was a nice touch. A subtle, minor character who has a profound effect on Helo provided an interesting way to motivate his actions. There's little else to discuss regarding this episode, however. Its best feature is its simplicity, but its worst feature is its simplicity. A better episode would have scrapped the entire A plot in favor of focusing more on Baltar's trial. Moreover, Tom Zarek is Sagittaron and very invested in the plights of the people. Why wasn't he more a key player in this episode? But I can't complain too much. The Woman King was an enjoyable episode, despite being largely stand alone filler. I disagree -- I am a big fan, but the last few episodes aren't good, and during this one I lost interest. I even switched channels! It was filler, when there are so many story lines unaddressed and ignored. This show is drifting away from its main issues. I disagree - this episode sucked! The idea that there's a group of humans who don't believe in medicine is just ludicrous, in my opinion. There's an episode of "House: MD" where House learns that a woman won't be vacinnating her infant child because she believes the pharmacy companies are "evil". After picking his jaw up off the floor, House lectures her on what an idiot she is, and rightly so. I simply cannot accept that BSG would have an entire group of people who refuse medicine. Also, the attitute, "We have to respect their beliefs" made me feel like I was watching Star Trek rather than BSG. This isn't a bad thing, it's just that BSG is a much darker show - remember when Roslin banned abortions in "The Captain's Hand"? She wasn't respecting the belief that a woman has a right to her body, she made the decision for the good of the human race in general, even if it wasn't popular. It would have been better if they injected the medicine by force - much more thrilling. And, better for the human race in general. If you haven't seen it yet, please, brace yourself. That said, I completely agree with you that the Sagittarons' rejecting of modern medicine is a completely stupid thing for them to do. But you must understand that I don't rate episodes based on whether or not I agree with the characters, but only whether or not the drama is realistic and compelling. I found the drama in this episode to be both realistic and compelling. It's realistic for the Sagittarons to have the beliefs they have. In certain senses they are not unlike the Amish people. And the drama that creates is compelling because as much our heroes disagree with the Sagittarons views, any kind of racism isn't acceptable. No, I haven't seen the finale yet... but I peeked ahead and saw you only gave it a rating of 1 - yikes! I agree that there was some good drama in this episode, and it was - barring the medicine thing - quite realistic. It was still better than most stuff on TV, just not up to BSG's usual high standards. Normally, I agree with your ratings, but on this one we differ. Oh, and I'd like to congratulate you on your site - when I first found it I was in nerd heaven. Keep up the excellent work!